The very nature of charity and welfare institutions as places to house the poor and the sick—the embarrassing segment of society, the least represented segment of society, the segment of society with the quietest voice—meant that they often disappeared or moved as soon as the buildings or land became attractive to wealthier segments of society. Anshelm Schultzberg's 1886 painting entitled "Demolishing the Old Orphanage"
With three important exceptions, Danvik, Serafims and Sabbatsberg, the physical premises of the 25-or-so charity institutions from the 18th century have had very little lasting influence on the physical Stockholm of today. Instead, these institutions have been far more important as a cultural springboard for the deeply-imbedded phenomenon of charity and welfare in Sweden today. During the middle ages, welfare and healthcare of the poor was financed and run by the Catholic Church. When King Gustav Vasa converted Sweden to Protestantism, all church properties were confiscated; technically the state took over responsibility for hospitals, orphanages, and homeless shelters in addition to the more advantageous assets of land, farms, and buildings. However, the state didn’t hesitate in returning responsibility for the poor back over to the churches in 1624 when it was decreed that every parish was responsible for their own poor. Funds for social welfare were to be gathered only through non-compulsory alms. Legally, the right to social welfare was extended to the bedridden, the blind, the crippled, and the lame—but only those who physically could not go out on the streets to beg. Orphans, widows, and elderly who didn’t have any living relatives were also deemed deserving of social welfare. A new legal decree in 1642 divided the responsibility for the poor into two. Local parishes were still responsible for supporting their poor in terms of food and shelter, but hospital care for the poor was taken over by the state. (I would just like to underscore the fact that Sweden’s poor have had the right to state-run healthcare for 373 years now, while the US is still questioning the need today, in 2015.) At the time, hospital care was the less expensive part of social welfare; the majority of the financial burden was still on the shoulders of local parishes, who were still only allowed to raise funds through voluntary alms and not through taxes. An exception to the parish rule seems to have been applied to orphanages, which were financed by the state. Stockholm’s “Children’s House” or Barnhuset was founded in 1633 and throughout the 1600’s, the orphanage’s goal was to finance itself by renting out its children as workers to textile manufacturers. During the 1700’s, the goal slowly shifted to preparing children for an self-sufficient, law-abiding, Christian-adhering adult life as textile workers (the boys) and maids (the girls). The children were given just enough education to accomplish these goals. Clearly, the local parishes weren’t meeting the demand for welfare because in 1686, a new law more clearly defined what was expected of the parishes, decreeing that every parish was to build shelters for its sick and homeless without delay. Furthermore, it was decreed that priests should remind their parishioners of their duty to (voluntarily) support the poor. Unsurprisingly, non-compulsory alms-giving wasn’t covering expenses, and after a series of bad harvests, the number of beggars on the streets continued to rise. In 1698 the king finally allowed churches to raise funds for social welfare through taxes: a half percent of inheritances now went to the church’s poorhouses. In an effort to stem the tide of beggars moving to Stockholm, it also became illegal to beg in a different parish than one’s own. Furthermore, illegal beggars in Stockholm were either to be sent home or sent to a workhouse; thus the city founded the Spinhuset or Spin House (see #2 in my post Långholmen: From Prisoners to Park). Conditions in Stockholm were unusually and extremely harsh from about 1690 through 1740. The number of poor rose drastically while funds for social welfare dropped. The city-wide (not parish-based) social welfare system had room for only the poorest of the poor; everyone else fell through the cracks. During this period, several wealthy private people (including the queen, but in a private capacity) founded poorhouses. These institutions were very important in providing for those who did not qualify for public welfare. In 1733, the public commission in charge of social welfare sent a letter to the king describing the shortage of funds for social welfare. A total of 517 Stockholmers were deemed in dire need of support, but the commission only had funds for 200 people. To compensate for the lack in funding, those who were entitled to support but whom received nothing were awarded a license to beg. It now became illegal to beg without a license and to give money to an unlicensed beggar. Each parish was to build and support its own poorhouse, but it took decades until all the parishes were in compliance. Maria, Katarina, Jacob, Johanes, and Hedvig Eleonora were most cooperative and had functioning poorhouses before 1747. Despite these measures, the destitute were still a visible and embarrassing presence on Stockholm’s streets. Before the 1700’s, Sweden did not have any knightly honorary orders, but three were created in 1727 as a way to reward and honor important persons without admitting them into the nobility and giving them land and titles. One of these orders, the Seraphim Order, was particularly useful as it was charged with overseeing the city’s sickest and poorest inhabitants. It was a great honor to be admitted into the Seraphim Order, and once admitted, one did not want to be seen as negligent of ones duties—members were subtly pressured to solve Stockholm’s poverty issues and to figure out how to make life less miserable for those living in poorhouses. The Seraphim Order did make significant strides including the establishment of Sweden’s first surgery, but the bulk of the fundraising and organizational work was still on the shoulders of the parishes. Parishes began to enact a tax on its parishioners in order to raise money to build and run their poorhouses. Property owners already paid a fire tax which was based on the value of their real estate. If you didn’t pay the fire tax, the fire brigades would not try to save your property in the event of fire. Various parishes doubled the fire tax, with half of it going to its poorhouses. By 1757, all but one of the parishes had established functional poorhouses. The most interesting of the parish poorhouses was Sabbatsberg, the combined poorhouse for the four parishes in Gamla Stan or the Old Town. Due to a lack of space on this small, densely built-up island, these parishes were granted permission to build their poorhouse on the edge of the city on the mainland. This poorhouse is still functional, though in newer facilities with a different name. 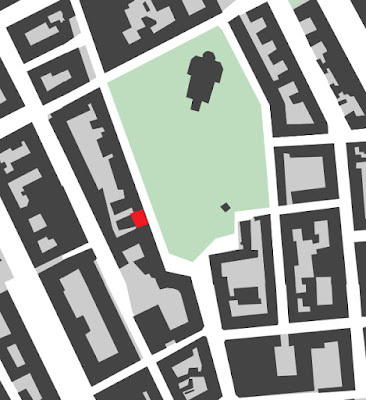 The area surrounding the poorhouse is still a relatively sparsely developed tract in the midst of downtown Stockholm. Life in a poorhouse was not easy. One source explicitly states that “The people’s needs would be provided for only so far that immediate survival was assured.” There was never adequate food or firewood—inhabitants were incessantly hungry and cold. Sickness was common and the death rate was extremely high. I haven’t found overall statistics but 65% of one orphanage’s inhabitants died within a 12 month period in 1710 (which seems to have been a particularly deadly year for Stockholm). Moreover, instead of seeing the poor as a drain on the system, it was thought that “’an extremely poor people are a country’s wealth.” The increasingly large population of poverty-stricken people was seen as an asset for Stockholm’s burgeoning manufacturing industry. Healthy poorhouse inhabitants, child and adult alike, were expected to work back-breaking manufacturing jobs in order to supplement the poorhouse’s income. Sabbatsberg took it one step farther as healthier inhabitants were only given a roof over their heads—they were required to find their own jobs and work in order to earn money for food, candles, clothes, a bed, and bedding. Inhabitants that were caught begging instead of working were punished. Many of the charity institutions bought or rented existing buildings and moved about as economics dictated. Some of these buildings have survived until today, but the demolition or survival of these buildings doesn’t have much to do with the charity institutions themselves since they moved around fairly frequently. Specific, custom-designed buildings were rarely but occasionally built for the institutions. When charity buildings were purpose-built, well-known, star architects were often commissioned to design these buildings—it seems that the donors wished to give the impression that they would spare no expense. Sometimes, however, the architects of these buildings submitted drawings for far more elaborate designs than the donors were willing to pay for, and the architects were required to simplify their designs. The original designs of these buildings tended to demonstrate a restrained classicism, but all ornament was value-engineered out of the projects to the point that they became unstyled and timeless—just looking at them it would be hard to know if they were built in the 1500’s or the 1800’s. Most of these buildings were purposely built of sturdy brick and stone; a greater percentage of the architect-designed poorhouses have survived to this day. Several of the poorhouses were given major overhauls in the 1700's, and these tend to have a restrained, classical style. Still, ornamentation was kept to a minimum and the only stylistic elements were a few pilasters on the facade. At the other end of the spectrum, many of the city’s poor were accommodated in cheap, crude wooden cabins. None of these buildings have survived. It is difficult to generalize about where the poorhouses were located because each case seems to have followed its own logic. The earlier parish poorhouses were built on the edge of the church grounds, but most of these were eventually moved to a concentrated location at the very edge of town—Sabbatsberg. Private institutions were more often housed in pre-existing buildings and moved around as certain neighborhoods or buildings became too expensive. 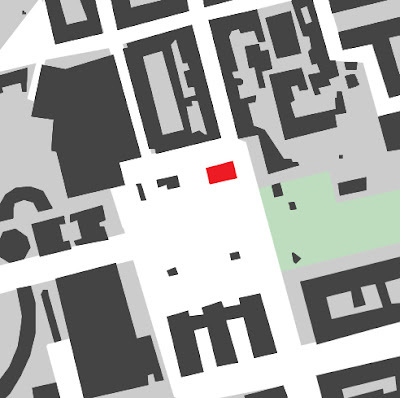 Occasionally, purpose-designed buildings were built which weren’t in prime locations but were still relatively in-town. Danvik’s Hospital, The Royal Serafim Order’s Surgery, and Sabbatsberg have had permanent impacts on the city’s fabric as they are each a large, seemingly unstructured “hole” in the city’s otherwise rigorous street grid. In the 1700’s, the Sabbatsberg area housed both a poorhouse and a health spa at a spring, but these functions eventually coalesced into a poorhouse and a hospital, which today have evolved into a hospital and several elderly homes. 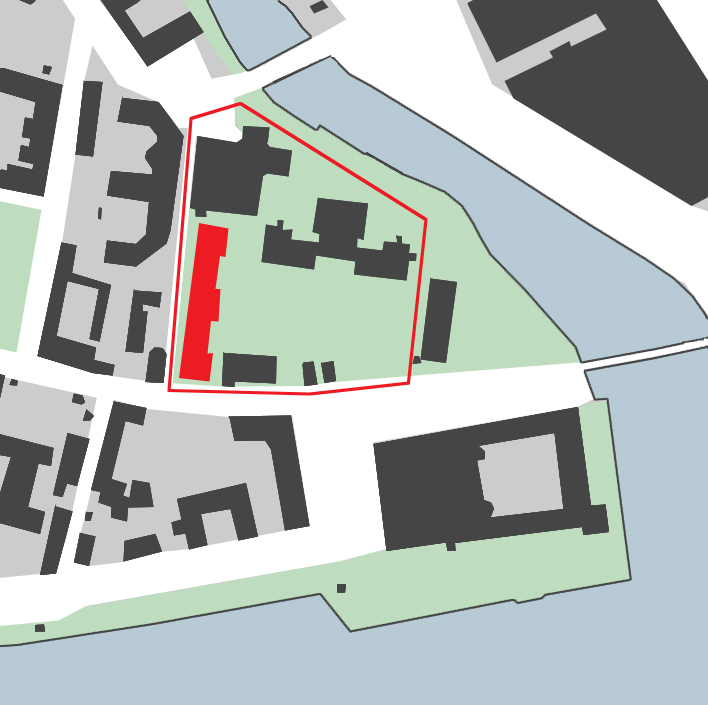 I mention Sabbatsberg’s development into a hospital because it is the only one of Stockholm’s 18th century poorhouses which have had a lasting impact on the city’s fabric while all three of Stockholm’s 18th century hospitals are still visible voids in Stockholm’s dense fabric. Danvikens Hospital was founded in 1551 when King Gustav Vasa ordered the existing (Catholic) hospital on Riddarholmen to be moved outside of the city in order to diminish the spread of infectious diseases. I haven’t read anything to this effect but I also imagine that Gustav Vasa’s decision to move the hospital also had a lot to do with the fact that he (the state) took over all Catholic lands during the Reformation. 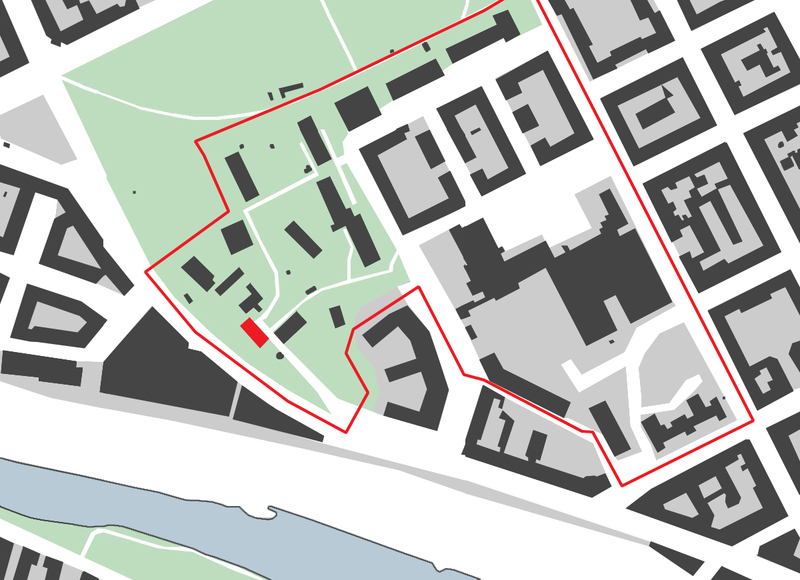 Suddenly, the hospital’s land on Riddarholmen could be used to more advantageous ends, such as granting palaces to favored generals and advisers. 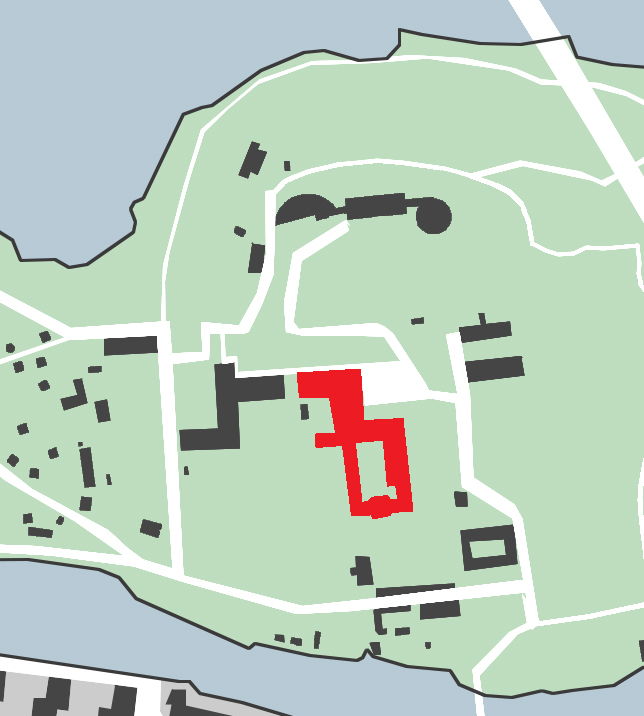 The original buildings at Danvik consisted of a wooden church, two wooden hospital halls, and many small administrative buildings and housing for the 50 (!) hospital employees. In 1568, about 100 patients lived in the hospital, including the elderly, the poor, war invalids, orphans, those suffering from sexually transmitted diseases, and the insane. At around 1700, penningsstugor or “benefit cabins” were relocated from near Johannes Church in Norrmalm to the hillside across the creek from Danvik. The cabins had burned in a large, neighborhood-wide fire and it was decided to relocate the residents “out of sight, out of mind.” These residents were poor, not sick, and they received housing and monetary benefits from the parish. The only building still standing at Danvikens Hospital is city architect Göran Josuæ Adelcrantz’s chapel and hospital building which was finished in 1725. The middle portion of the building with double-height windows is a chapel, and four hospital halls are in the wings on either side of the chapel. This building is relatively free from ornament except for its distinctive roof form and carved entry portal. In the 1740’s a separate insane asylum was built on the hill across the creek from the hospital. 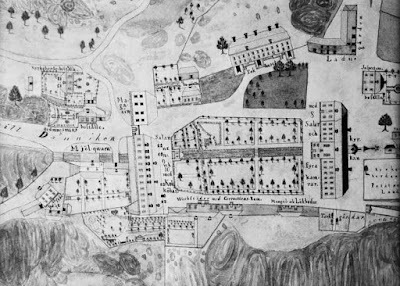 This map from 1848 shows Adelcrantz’s main hospital building surrounded by pleasure gardens, kitchen gardens, a barn, a house for widowers, a corrections room, workshops, a hotel, a flour mill, a vicarage, and an administrative building among others. Throughout the 1900’s, the area was used as an industrial grain mill, and it wasn’t until the last few years that the area has been redeveloped into housing. but Johan Carlberg renovated and enlarged the building in the 1720’s, giving the building a classical, symmetrical look. 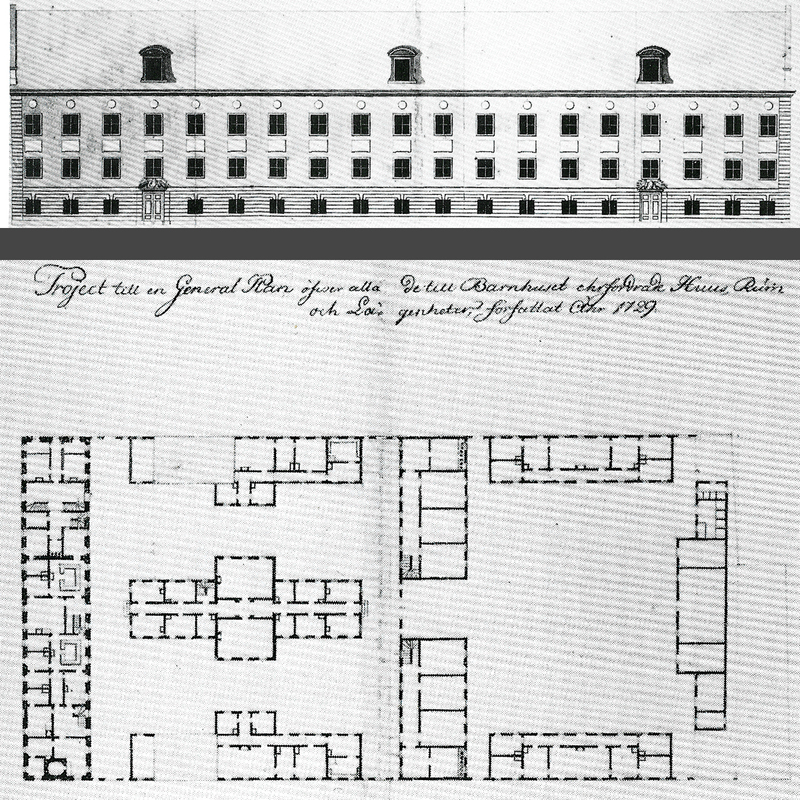 Carlberg's plan for the expansion of Barnhuset and the updated, symmetrical facade. In 1885 Barnhuset moved toward the edge of town to a new complex designed by Gustaf Dahl. Today, the buildings comprise a hospital. A portion of Dahl's large complex. While I have not included any of the other 20-odd institutions that were operating during the 1700’s but have no visible 18th century traces today, I have chosen to include Barnhuset because it has had a strong impact on Stockholm’s cultural awareness. It is repeatedly mentioned in poems, songs, and novels; it was the subject of several well-known paintings and etchings; and it was an important landmark in the city’s landscape giving rise to Barnhusgatan (Barnhus Street), Barnhusbron (Barnhus Bridge), and Barnhusviken (Barnhus Bay) which still appear on maps today. Drottninghuset is unique because a) it is Sweden’s oldest, still functioning social welfare institution, b) it is still used for the same purpose of housing and supporting impoverished widows as when it was founded, and c) it is still in the same building as when the institution opened in 1689. Drottninghuset is a private institution which was originally financed in large part by a private donation from Queen Ulrika Eleonora. 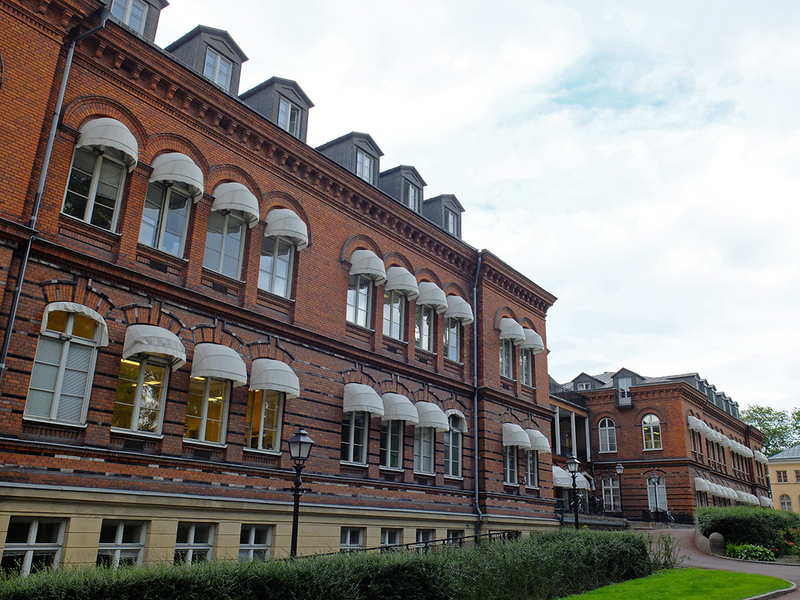 The sturdy brick building was designed by engineer and vice-city architect Mathias Spiehler with few frills aside from an extremely simple stone portal. 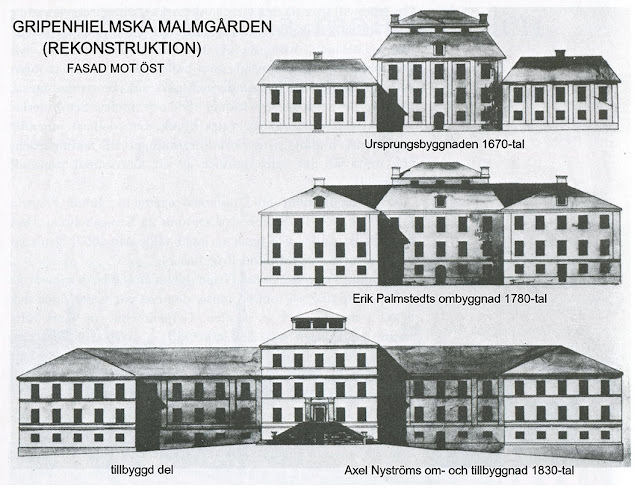 I have found no other information on how the building looked as today’s facade is the result of a renovation by Carl Fredrik Adelcrantz (son of Göran who designed Danvikens Hospital above) in 1775. 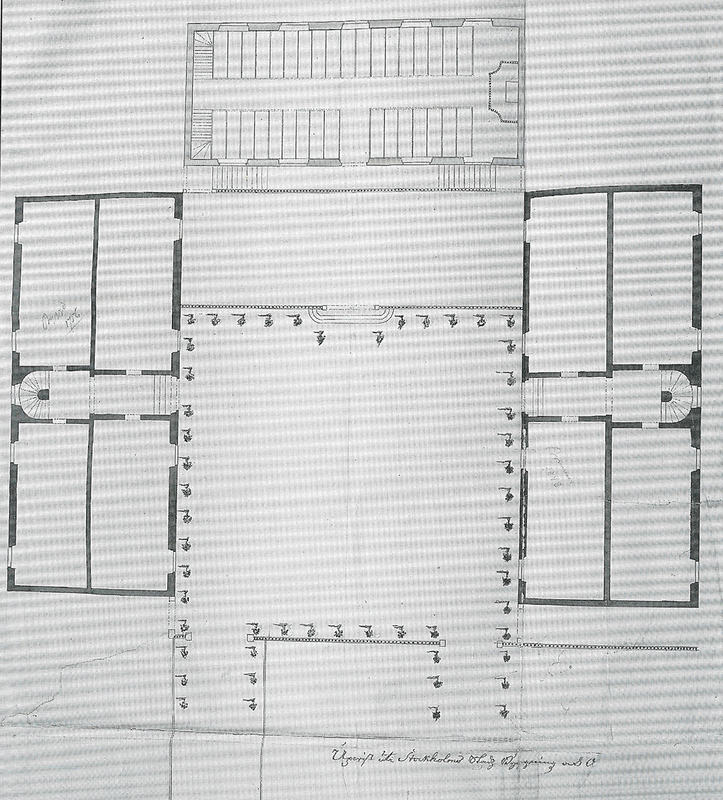 Adelcrantz’s drawings actually date from 1768 but funds for the renovation were hard to find. Another queen, this time Queen Sofia Magdalena, eventually donated the renovation funds when the roof threatened to cave in due to disrepair. After the renovation, only the outer walls were original—the building’s interior was completely gutted and the floor levels and roof were even raised to create more generous room volumes. 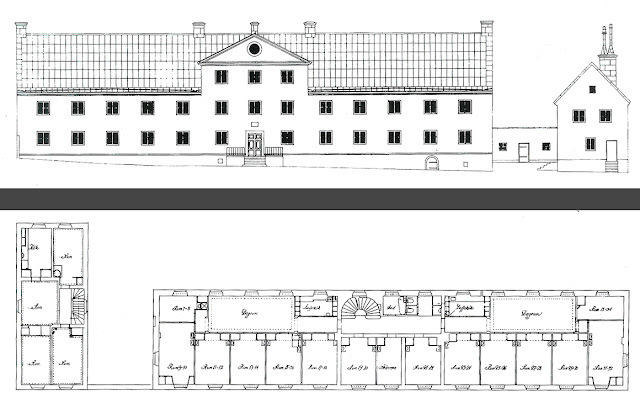 Adelcrantz was Stockholm’s hottest architect and he designed several palaces for King Gustav III. His renovation of Drottninghuset is of course more restrained but his simple classical style is visible in the regular rhythm of the pasted-on pilasters. Adelcrantz's renovation drawings--front facade and second floor. Note that the beds are in a big dormitory space. Yet another 100 years later, the building was in need of renovation again. The institution wanted to sell the building and move into more modern facilities, but the king denied the appeal. Instead, an extensive renovation was drawn by Ärland Noréen and completed in 1925. This time, the building was not completely gutted and as much as possible was saved and reused including tile stoves, wood trim, floor boards, etc. Items which had to be replaced due to rot were copied to the smallest detail. Noréen's drawings--front facade and second floor. Note that separate rooms for two people are now part of the design. A small wing to the north of the main building had been added back in the 1680’s, and in the 1940’s, a new ultra-modern wing to the south of the building was added—in the new building, every room was private and had a small kitchen and even a private WC! This was quite a contrast to the original main building where beds were out in the open like a traditional hospital hall. Even though thin, wooden partitions had been added by 1924, residents lived a very public, on-display life. Today, all of the rooms are small private apartments. Left: The wing from the 1680's. Right: A photo from 1924 shows that the inhabitants enjoyed very little privacy. I have included Spinnhuset only because it was a significant part of Stockholm’s solution to poverty—getting the beggars off the streets, locking them up, and forcing them to work. However, the Spin House was hardly a charitable or welfare institution but was a prison. 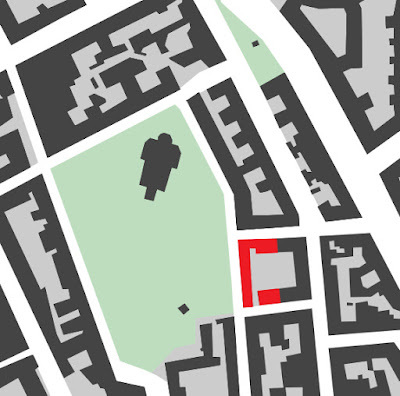 I have written about the Spin House in greater detail in my post Långholmen: From Prisoners to Park. I have not found further information on this institution as to its evolution, how long it lasted, etc. In the 60’s, the building was used as a gay night club, but today, the building is part of the French School. 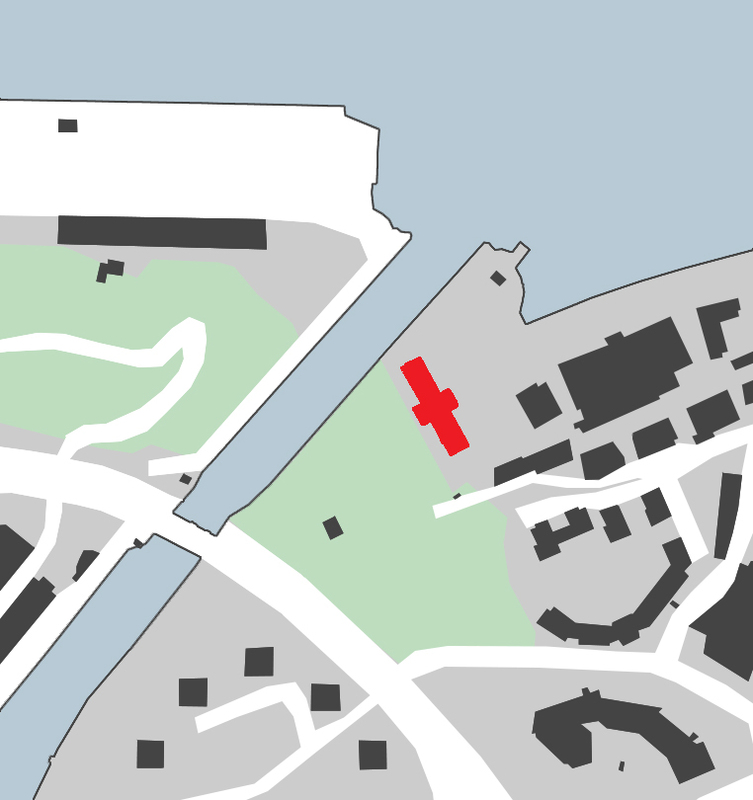 Although, or perhaps because, Katarina Parish was one of Stockholm’s poorest parishes, Katarina was the first parish to found its own poorhouse (it was founded sometime between 1737 and 1747). The parish first rented a house for the purpose; later, in 1754, the parish bought the former Lillienhoffska Palace to house its poor. (See #16 in my post Palaces from The Time of Great Power in the 1600's.) The poorhouse stayed in this location until the 1880’s when it moved to Sabbatsberg. The original building after its extensive renovations and expansions. The Serafim Surgery was Sweden’s first surgery. It was founded by the Royal Serafim Order in 1752 when a large house built in the 1670’s, called Gripenhielmska Malmgård and garden (otherwise known as the Hornska huset), was purchased for the purpose. (I missed this malmgård, or suburban farm in my earlier survey.) The French Baroque garden was redesigned by Sweden’s famous botanist, doctor, and scientist Carl von Linné into a medicinal garden. Left: A painting from 1700 shows Gripenhielmska Malmgård in the foreground to the right and Stockholm in the background. Right: A map from 1724 shows the house and garden at the point of the island of Kungsholmen. The house was renovated and enlarged by one floor in 1785 by Vice City Architect Erik Palmstedt. It seems that Palmstedt simplified the facade and did away with the pilasters. 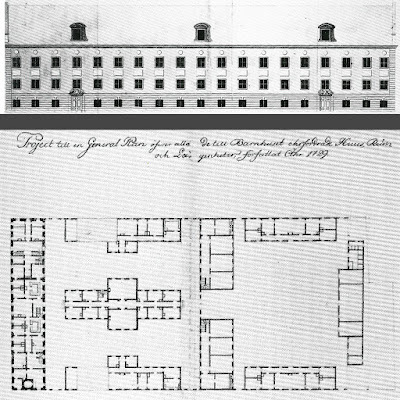 The building was nearly doubled in the 1830’s when Per Axel Nyström “moved” the central part of the building by adding two new bays. 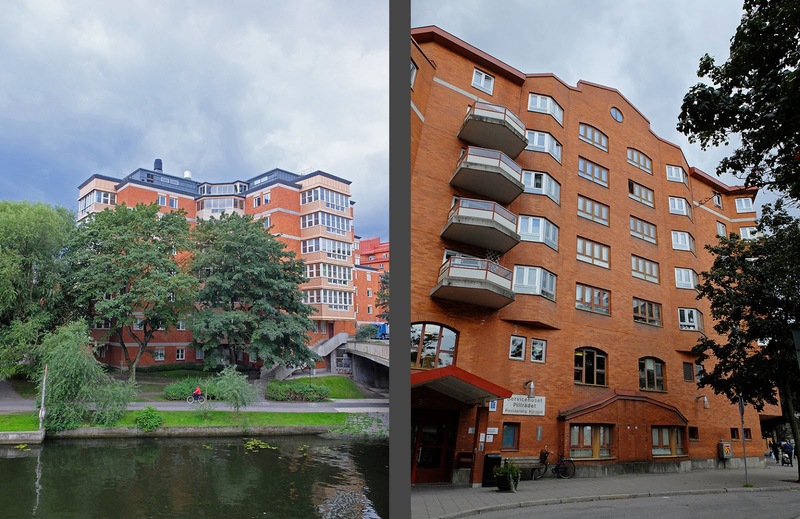 In order to de-emphasize the old central section of the building, Nyström took away the distinctive and old-fashioned roof form. The new central section was given a small roof porch. At some point in time, dormers were added so that the attic could be utilized as hospital space. Top: The original house from the 1670's. 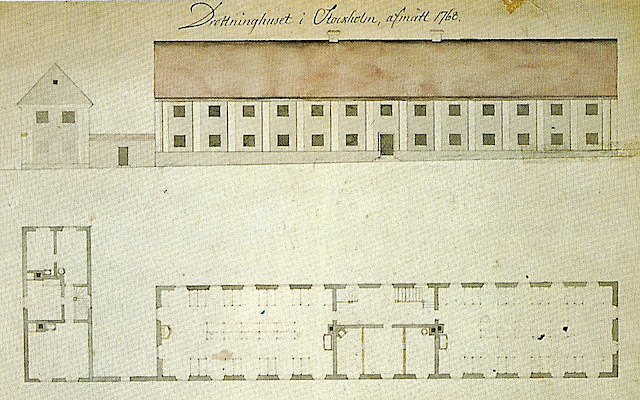 Middle: Palmstedt's renovation from the 1780's. Bottom: Nyströms renovation and expansion from the 1830's. In the 1880’s, space in the building ran out again, but the building simply could not be enlarged again. Instead, a new building was built on the property. 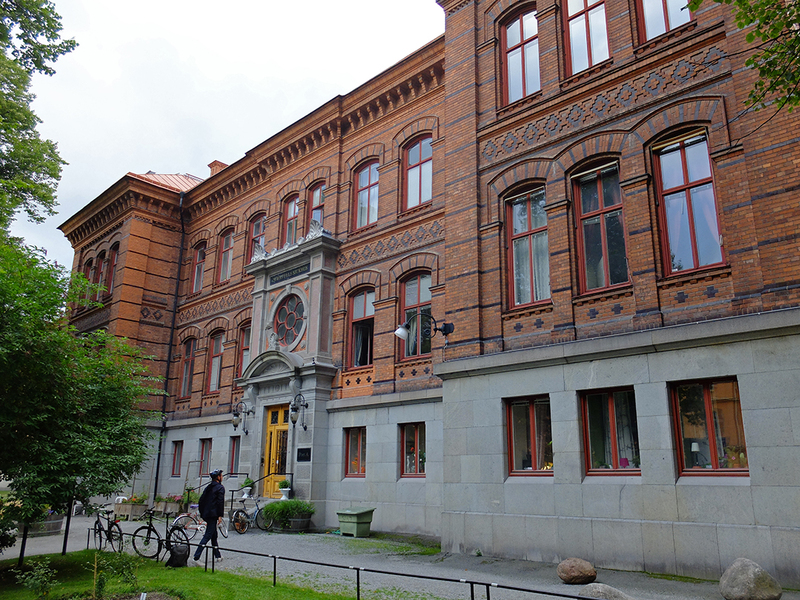 Axel Kumlien's new building opened in 1893. The hospital was a research and teaching hospital from its founding until the 1980’s. Today, the hospital complex consists of several buildings and a wall which enclose a central park-like green space. Several buildings are still used for medical functions such as a minor-emergency clinic and a child health clinic, and there is even a large home for elderly with 176 apartments on the campus. Modern housing for the elderly. 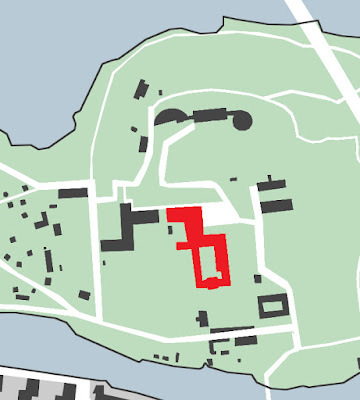 Because real estate on the island of Stadsholmen (Gamla Stan, or the Old Town) was expensive and hard to come by, Gamla Stans’s parishes decided to build their poorhouse on the very outskirts of town on the mainland. They bought a former malmgård and hired City Architect Johan Eberhard Carlberg to design their poorhouse. 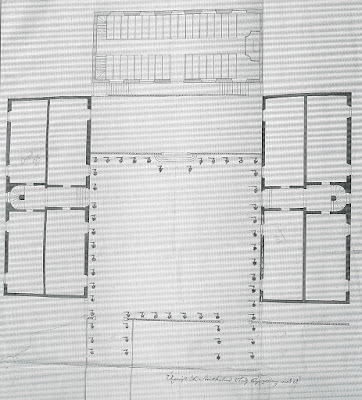 Carlberg’s plans from 1751 were a bit excessive with a four bending wings fanning out from a central church and forming an octagon. The parishes turned instead to a mason who was hired to build a “barracks” for 300 people. Mason Peter Westrell drew a very simple compound consisting of renovating the existing house into a church and two new flanking buildings. 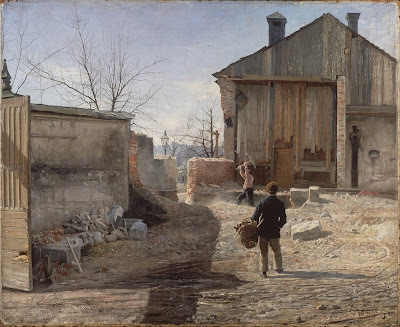 Eventually, it wasn’t just the Gamla Stan parishes that housed their poor at Sabbatsberg—during the 1800’s, nearly all of Stockholm’s parishes moved their poorhouses to Sabbatsberg. New buildings, one for each parish, popped up regularly. Klarahuset was built by the Klara parish in 1812 and Johannes parish built Johanneshuset in 1872. The Sabbatsberg area was also home to a health spring and spa which was popular with Stockholm’s upper classes in the 1700’s. To shield the wealthy from the poorhouse’s inhabitants, a solid plank fence was constructed between the two institutions. As the fashion changed and as the quality of the spring worsened, the spa became less and less popular and eventually closed when the spring stopped running altogether due to nearby construction. This building was originally built in 1767 as a hotel for health spa guests. The trapezoidal form is indicative of the buildings use as a health institution as Egyptian motifs were symbolic of the medical profession in the 1700 and 1800’s. In 1880, after the health spring closed down, Katarina parish adapted the building for use as a poorhouse. Over the centuries, the poorhouse and health spa institutions at Sabbatsberg merged into one enormous poorhouse/elder care/hospital operation. 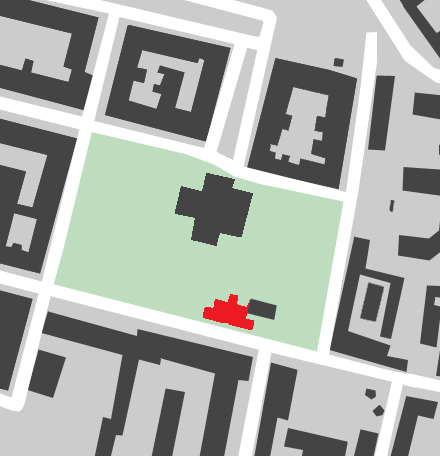 Today, the area is still in use as several types of elder care and as a large hospital, all sited within a large, park-like setting. Many of the older buildings are also used for elder care, but newer, more modern buildings have been added to the campus throughout the years. 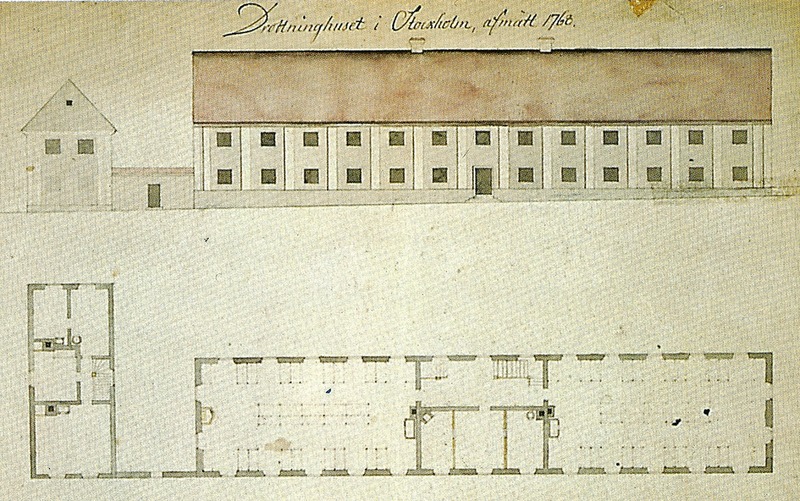 Kungsholmen was the last parish to build its own poorhouse. The necessary funds were lacking until one of the parish’s poor widows, who was supported monetarily by the parish, inherited money from a long lost nephew! Widow Anna Forsman donated her sizable inheritance to the parish with the goal of funding a poorhouse. A year later, the poorhouse, which was sited on the edge of the church’s grounds, opened its doors. The building is still owned by the parish today and is used for church functions. Sweden’s attitude toward the poor has changed considerably from the early 1700’s to 2015. In the 18th century, the poor were regarded as an embarrassing blight on the city of Stockholm which was to be hidden away from sight. Furthermore, they were seen as an exploitable workforce which would build a profitable manufacturing industry in Stockholm. At the worst, the poor were an expensive nuisance; at best, they were exploitable labor. Today, poverty in Sweden is just about nonexistent, at least among native-born Swedes. A strong social welfare system and safety net provides many layers of support before one finds oneself on the street. While there are homeless in Stockholm, the numbers are next to null when compared to American cities. Swedes are proud of their system and are proud to pay taxes in order to support the welfare system. Everyone seems to feel that it could just as well be them that will need the safety net in the future—there is not the same feeling of invincibility, that it could never happen to me—or of otherness, that the poor are not of the same ilk as me—that is the prevailing attitude among America’s wealthier strata. In the end, everyone, not just the poor, uses the tax-funded safety net available to elderly Swedes—help at home for as long as possible followed by a move into an elderly care home. Additionally, nearly-free healthcare is universal in Sweden, and it is not tied to having a job. Employed and unemployed alike have access to the same excellent health system. However, Sweden’s welfare system is faltering. Privatization and other factors over the last 20 years has meant that the level of service has gone down while costs have gone up. More and more people are falling through the cracks. Within the last 10 years, the homeless population of Stockholm has gone from zero to just over 100 people. Negligent care of the elderly care and of the disabled by underpaid, under-educated care workers makes the headlines every week. Beggars, unknown in Stockholm 10 years ago, are now a ubiquitous presence on every street corner, inside every subway station, and outside of every shopping center. This phenomenon is not restricted just to downtown Stockholm as beggars are now common sights even in the suburbs and in small towns. The vast majority of Stockholm’s beggars are migrant beggars from poorer EU countries, especially Romania. They are in Sweden legally, and Sweden is in turmoil over what to do about this new “invasion.” In response to this problem, Denmark has made begging illegal and Norway is considering a similar measure—which has just made the situation worse in Sweden. Most Swedes are reluctant to talk about the begging problem because they don’t want to sound racist. They don’t want to exclude Romanians from the right to a decent life, and they are genuinely grief-stricken over the problem. They genuinely hate seeing so many suffering people, and they know that banishing the problem out of sight like Denmark and Norway is no way to solve the root problem and to make life better for those who have it so bad in Romania that they are reduced to begging on Sweden’s streets. At the same time, Swedes feel overwhelmed. Sweden already accept more asylum-seekers per inhabitant than any other EU-country. A few years ago, Sweden removed all limitations to Syrian asylum seekers and asylum-seekers are flooding the immigration system which is well over capacity. The beggars on the streets feel like an affront—Sweden already does so much to help other, poverty-stricken people, and yet the streets are practically flooded with still more who need help. Poverty, which for forty years or so was more or less banished from Swedish society, is back in full-force. But this time, the poor are not Swedes. It is no wonder that the formerly neo-Nazi party, Sveriges demokraterna or Sweden’s Democrats, won 14% of the vote in the last election. In a sneaky campaign move, Sweden’s Democrats equalized Sweden’s falling services such schools and elderly care with rising immigration. The message was clear—the recent focus on “others” means that “we” have less. Thus, Sweden’s Democrats mean to stem the tide of immigration. While a scary 14% of Sweden was duped by this reasoning, most of Sweden saw the racist propaganda for what it was, and most are utterly embarrassed and dismayed that the neo-Nazi party gained such a following in the last election. But the problem remains—Although most Swedes would want to, little Sweden cannot fix the world’s problems and give a good life to every person on the planet. So how is Sweden to prioritize? Should Sweden keep its borders open to the world’s asylum-seekers? Should Sweden focus on EU-citizens instead? Should Sweden close its borders, leave the EU, and focus on its own citizens? Should Sweden propose an entirely new, entirely radical strategy that would require the cooperation of all the world’s countries? Looking back on Stockholm’s history of welfare and charity institutions from the 18th centuries provides no real answers to these complex modern issues. But, one does see history repeating itself. Stockholm sending beggars back to their own parishes. Stockholm making begging illegal. Stockholm embarrassed about its overwhelming problem of poverty and removing the problem out of sight. Today, most Stockholmers would look back at these laws and practices of the 1700’s and laugh, embarrassedly, at the barbaric treatment of the poor. But Sweden, and its Scandinavian neighbors, are making and threatening to make the exact same decisions today. Norway sends beggars back to their home country. Denmark has made begging illegal. Sweden is embarrassed to see so many beggars on the streets and the Sweden’s Democrats party wants to stop immigration, removing the problem from Sweden’s borders. Surely, maybe, hopefully: Can humanity can find a better solution than repeating its laughable three-hundred year-old mistakes?